← What is Corticobasal degeneration (CBD)? 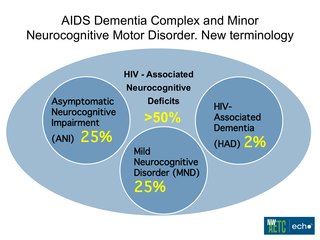 What is HIV-associated neurocognitive disorder (HAND)? HIV (human immunodeficiency virus) causes an infection that weakens the immune system, making it harder for the body to fight infections and disease. HIV infection can cause a number of different problems in the brain, which affect up to half of people with HIV. This is known as HIV-associated neurocognitive disorder (HAND). HAND is one of the rarer forms of dementia. Rarer forms account for only around 5 per cent of all dementia cases in the UK. The Mildmay Hospital provides holistic inpatient and day care services for people with HAND (see ‘Other useful organisations’).